The majority of drivers do not look for pedestrians or cyclists before turning right, a new study has found. 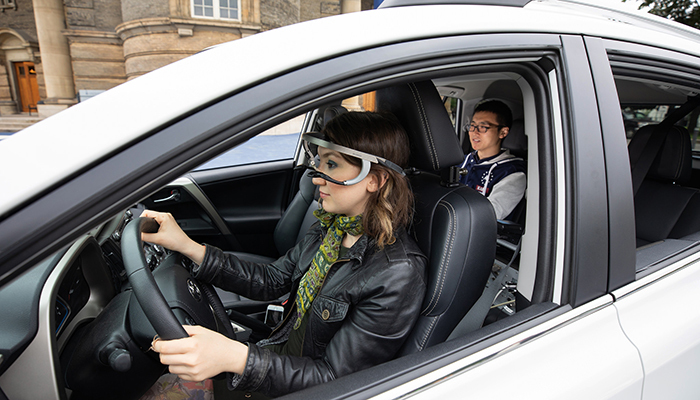 University of Toronto (U of T) Engineering researchers monitored drivers’ eye movements. They wanted to determine how many failed to shoulder check; especially those who regularly drive downtown. The researchers tracked drivers’ eye movements at busy intersections in Toronto. The study showed that over half of drivers failed to look out for pedestrians and cyclists when turning right. There has been a string of traffic accidents involving pedestrians and cyclists this summer in Toronto. As of June, there have been twenty-one fatalities. Nazli Kaya and colleagues say that their study gives new insight into a vehicle driver’s misallocation of attention. Specifically, when they are turning in the city’s busy streets. Kaya led the research under the supervision of Prof. Birsen Donmez, Canada Research Chair in Human Factors and Transportation. The researchers said that many drivers did not look over their shoulder for cyclists or pedestrians when turning right. This is the first study to use eye-tracking equipment to determine where drivers were looking. Specifically, where they were looking at intersections. All the drivers were between 35 and 54 years old and had at least three years of driving experience. The researchers observed the participants turning right at Palmerston Avenue from Bloor Street. This is a signalized, four-way intersection. They also observed them turning right at Major Street from Bloor Street. This is an uncontrolled T-intersection that leads to a smaller road. In both intersections, drivers were turning right across a dedicated Bloor Street cycling lane. – Fifty-eight percent, i.e., eleven of the 19 drivers, failed to gaze at an area of importance before turning. This area had cyclists and pedestrians. – Every attention failure was related to not making regular over-the-shoulder checks for cyclists. – The researchers registered more failures when drivers were turning right into Major Street. This was because there were parked vehicles which blocked the drivers’ views of the cycle lane. Drivers who were less familiar with an area appeared to be more cautious when making a turn. To improve road safety, town planners need to make adjustments to the road infrastructure, Prof. Donmez believes. Toronto streets face many hazards, Prof. Donmez explained, and pointed to the inconsistent implementation of cycle lanes. Infrastructure refers to all the systems and structures that a country or city has. Road, bridges, cycle lanes, and traffic lights, for example, are part of a country’s infrastructure. Until the town planners have carried out those infrastructure changes, drivers need to be more careful, Prof. Donmez said. They need to make over-the-shoulder checks. They also need to make them more often, especially when turning right. The researchers recently presented their study and findings at the Canadian Association of Road Safety Professionals (CARSP) Conference. This fall, Prof. Donmez and Kaya plan to build on their work. They will be conducting road tests with a greater number of participants. They will also be observing drivers in more intersection locations across the city.